When you stretch a rubber band too far, it snaps back in the other direction, hard and fast. That is an apt description for the paper gold market right now. In the paper gold market, when speculators sell gold, they put on "short" positions at the COMEX, the primary futures metals exchange. In the short run, these paper trade flows can drive commodity pricing. In August, gold speculators switched from a bullish position to an extreme bearish position and the price of gold fell swiftly lower. However, this is not a bear market situation. This is a bull market story in gold. Speculators total short positions in gold on the Comex exchange is measured by the CFTC Commitment of Traders (COT) report. This is a useful tool to gauge whether a trade is crowded or not and whether there is more flow to come or if the market is oversold. In August, speculators short positions in Comex gold hit an extreme high reading. What Does This Mean For Gold Prices? Extreme speculative activity on the short side as measured by the COT report typically presages major bottoms. This suggests a bottom for gold prices could be close or already in. Futures short-covering is often the first stage of a major bull market move in gold. When speculators sell gold futures short, they don't actually own gold or a gold futures contract. In order to exit their position, they need to buy a futures contract. In futures trading that is called "Short-covering" or a "Short-Squeeze." When you stretch a rubber band too far it snaps back. 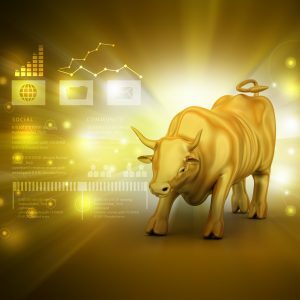 The gold market is primed to snap back to sharply higher levels. There are a number of potential macro triggers out there and any one of them could start a short-covering rally. If gold pops higher for any reason, these speculators will be forced to run for cover and will need to buy gold back so they don't lose more money. As they buy back all these short positions accumulated over August it will drive the price of gold swiftly higher. What Could Trigger A Short-Squeeze In Gold? Here's a brief look at a few factors that could send gold spiraling higher this fall. Gold typically trades in an inverse relationship to the dollar. As the U.S. dollar moves higher, typically gold moves lower. Last week, the Wells Fargo Investment Institute released a new report to its clients. They upgraded their outlook on commodities to favorable. One reason is the U.S. dollar. "We expect the dollar to depreciate from current levels by year-end 2018 and through June 2019," the WFII report said. While October typically has a bad rap in the stock market, it turns out September has historically performed the worst. That's good news for gold. A quick pullback or correction in the stock market would drive gold prices higher in safe-haven buying. The worst September ever for the S&P 500 was a 30% drop in 1931. In fact, no other month has had more 10% drops than September, at seven, according to LPL Financial. “September is the banana peel month, as some of the largest slips tend to take place during this month. Although the economy is still quite strong, and stocks are marking hew highs, this doesn’t mean some usual September volatility is out of the question—in fact, we’d be surprised if volatility didn’t pick up given midterm years tend to see big moves in the months leading up to the November election," said Ryan Detrick, senior market strategist at LPL Financial. By definition, a black swan event is one that no one sees coming. The 2008 Financial Crisis is a great example. Gold historically performs well during economic, political and military conflict. Any Black Swan event would likely send gold spiraling higher. If you haven't fully diversified your portfolio with at least 10% physical gold, the technical data from the CFTC COT report suggests a bottom in gold may be occurring now. The Blanchard portfolio team can help you design a personalized diversification plan with tangible assets to help you meet your specific financial goals. Give us a call today.